Mother knows best! 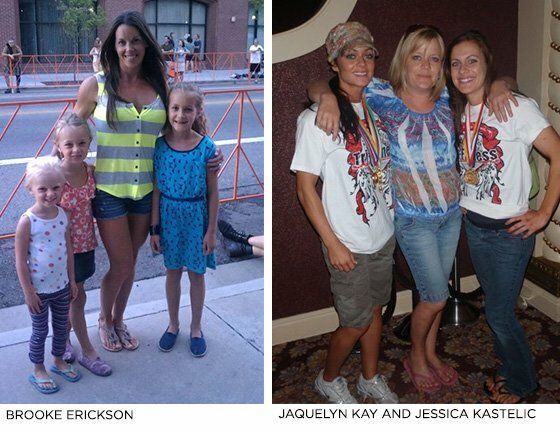 Members of Team Bodybuilding.com thank their moms for inspiring a life of health and fitness. Mother's Day is a chance to celebrate the incredible gifts our mothers have given us, including life, wisdom, support, and guidance. 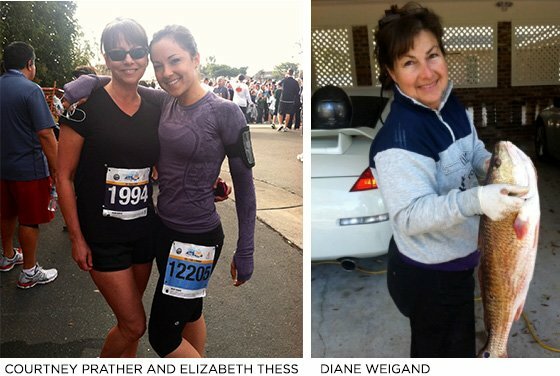 We asked members of Team Bodybuilding.com to tell us about the impact Mom made on their decisions to live fit. 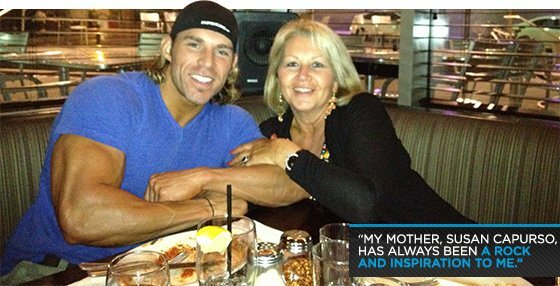 One of the biggest influences my mom had on my health and fitness lifestyle was making us eat dinner together as a family every night. Instead of sitting on the couch eating TV dinners and snacking on junk, we cooked dinner together from scratch and sat at the table together as a family. This is definitely something I'll do when I have a family of my own. I love you Mom! My mom has supported me since the age of 4, when she enrolled me in dance class, ballet, tap, and jazz. She supported me on the pom-pom squad throughout high school, college, and as an NBA cheerleader for the Chicago Bulls. She traveled to many of my fitness competitions across the U.S. taking of pictures of not just me, but of all the girls on stage. She would send out Christmas cards in July of me on magazine covers and Chicago billboards to brag to our family and friends. If I was on TV, she would always phone to ask me what channel I was on and when. She even sent a picture of me in a bikini to her pastor, which he mentioned when speaking at her wake. 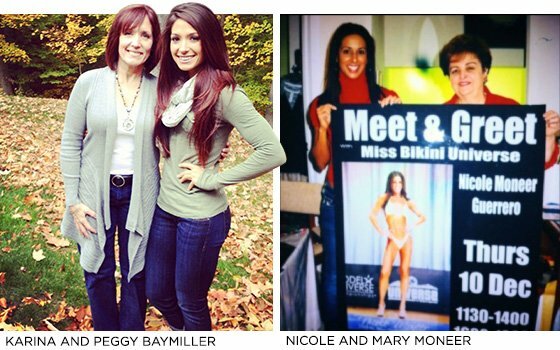 Mom died unexpectedly last March 2012, so she did not get to see me hit the Bikini Olympia stage or hear and see pictures from competing at the Sheru Classic in India. She was my biggest fan throughout my entire life. I am grateful to have had her support. I know there are many out there who do what I do and without their parents' support. My mom was amazing! I love her for being a constant presence in my life. It has definitely had a positive impact. My mother, Susan Capurso, has always been a rock and inspiration to me. She's proven with her recent battle with stage 3 breast cancer that you can never give up. Set your goals and sights high and do everything in your power to chase that dream. Her dream was living another day to watch her kids grow up. My mom has influenced me more than anyone else in my life. She worked full time to raise me as a single parent, while teaching me the value of hard work and independence. As a child my mom set the example for healthy living, always making her fitness a priority and making sure she did what she had to so that I could play soccer, softball, and gymnastics—and I never missed a practice. Growing up, my mom enrolled me in every sport possible, and I'm pretty sure it was because it was a form of free childcare. But as I grew older, she became more and more involved, eventually becoming my soccer, softball, and basketball coach. There weren't enough coaches, and if the team didn't have a coach then we couldn't play. So she learned how to play these three sports, assumed the position of coach, and held that position for several years so that my teams were able to participate. She is the only reason myself and quite a few other people were even able to participate in team sports, so I'd say she was the single most important factor in helping me to engage in an active lifestyle, which I continue to this day. My mom worked full-time and we were fairly poor, so I was raised on cheap drive-thru hamburgers and chili. When I was little, both my parents would run every night and go to the gym at their place of employment—where I would build mazes out of the tumbling mats. So I grew up knowing nothing about food, but loved to be active. I try to teach my kids balance in both aspects. I'm not a good cook, but I understand macronutrients and their purpose. While my kids enjoy their fair share of ice cream cones, as they have gotten older they have learned what "healthy choices" mean and that being active is a part of living a full life. My mom always encouraged me to participate in sports. She was always at my events to support me, and when I got into phsyique competitions, she was very supportive of the lifestyle. Now when I visit her she asks me to make paleo recipes for her! When I graduated in May 2012, I closed the NCAA chapters of my life to join the fitness world. My mom has inspired me to stay on track and keep myself accountable because it inspires her to see the commitments I have made while competing in this sport. Not only that, she has kept me motivated to be a good role model because the things I've learned about nutrition I can share with her and with my family. I wouldn't have had the determination, willpower, or work ethic and passion that I do without the backbone and love from my mother. My mom encouraged me to play sports and be active by being outside. Now that I think about it, she probably did that because it was much cheaper to buy a basketball instead of a Sega! She also bought me 10-pound dumbbells, which is what first sparked my interest in lifting. 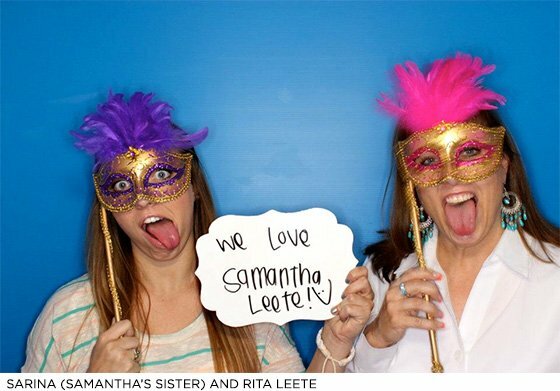 I love my mama! Being a former athlete, coach, and PE teacher, my mom was always very active, and I was right alongside her when I was young. I participated in the sports she coached or experimented with a new piece of gym equipment. I was raised around health and fitness, so it was second nature because that's what I knew. It certainly made the transition into my individual lifestyle seamless since it was always a part of what I did. My mother has always been a huge support for me. 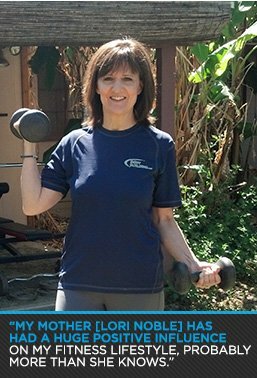 She has always encouraged my fitness lifestyle and done everything she can to help. When I was younger, she allowed me to participate in many different sports and always came to my events to root me on. Since I have started bodybuilding, she has supported me and even become interested in the lifestyle, learning a lot about living healthier. We have been able to transform our bodies together. I'm very proud of her and so thankful she is my mother. I'm blessed to have such a strong, beautiful, caring woman in my corner. Love you, Mom! I don't have children of my own children, but I always tell everyone I have children—the high school girls I coach! I believe it is so important to encourage them to live fit, and even more important, set an example for them of how to do that. It warms my heart when I see one of the girls and they are so excited to tell me about how they have been eating healthier or, even better, that their whole family has been eating healthier. My mother has had a huge positive influence on my fitness lifestyle, probably more than she knows. I remember as a little boy waking up in the morning and watching my mother in front of the television, either engaging in some of those famous old workout DVDs, like Buns of Steel, or just simply watching the morning news while jumping on her mini trampoline. I now incorporate a mini trampoline into my cardio routine. It's an easy way to stay motivated to do cardio while watching a great movie. My mother also was my biggest fan growing up playing sports, the loudest most-enthused person on the sideline; she never missed a game. Her example of being active, playing sports when she was younger, encouraged me to do so also. Happy Mother's Day. Love you, Mom.